How long have you been working for CERN? I started working for CERN 17 years ago, in 2001. I have spent most of my professional career at CERN. I have been in my current role for nearly 3 years now. Prior to this role I was Deputy Group Leader within the Information Technology Department at CERN. What is your background? What did you do/study before working for CERN? I have studied Telecom Engineering in Madrid. I worked in Spain and then in Sweden as software developer, tester, designer for telephony applications in the Telecom Telephony industry in an international environment. I worked there for 3 to 4 years before joining CERN. What first attracted you to work for CERN? A combination of elements attracted me to work for CERN. At first, before applying at CERN I was convinced that you needed a very strong background in physics to be considered for a career there. I knew some people working for CERN who gave me some insight and then decided to apply for one of the positions advertised. What really attracted me was the international collaboration within the organisation and the science research, something that I hadn’t experienced in my career at the time. The combination between innovation, collaboration and the international environment made it very attractive for me to join CERN. I don’t look like a geek! Very often people think to work in IT you have to be a geek, or at least look like a geek. But I don’t match this stereotype and people are always surprised when I tell them what I do. In actual fact, I have a family, I have a social life and I don’t spend my free time on computer. 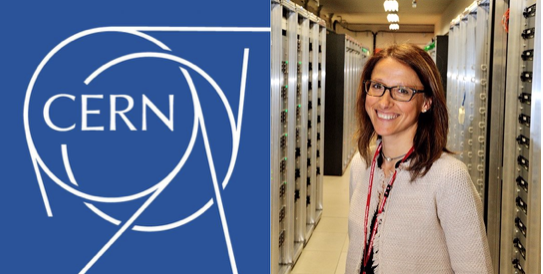 Can you please tell us your insight as a woman working at CERN? I have had a very good experience working at CERN as a woman. It is true that we are not many women but as it is the case today in the IT industry in general. However, as a woman you learn to develop your own way to deal with being a minority. In my case it was all very natural, I never had any serious issue as a woman working at CERN. It is true that sometimes you feel the difference, however CERN has a very strong push for diversity and for respect, which is prominent in our code of conduct. And it has been a consistent fact in my career. What is the best thing about working for CERN? A combination of science goals mixed together with technology and innovation. It is in everything we do, and always within an international collaboration environment. This the amazing strength of working at CERN, it is so multicultural, it is embedded in everything we do. What are your proudest achievements within your career? It might seem like a small technical achievement but for me it was the turning point. My first task when I started to work at CERN was to produce a survey of tools to run a large size computing centre. I was working alone, not in a team and I had to interface with many people at CERN and many other labs. I had no contact and I was new to the field. It was a real challenge for me. However, I managed to complete my project and I was even praised for its success. I really enjoyed it and I proved not only to the organisation but also to myself that I was capable of achieving such a challenging project. I demonstrated that I was an added value for the organisation and that I had my place there. This achievement enabled me to get where I am today. What has been your greatest challenge as a woman during your career? My greatest challenge has been to take the position where I am today, a high-level management position, after my own doubts that I would be capable of doing it, with my profile and keeping the balance in my personal life. I joined a management team who was all male and who all had a very similar profile. I felt different and I felt I had to demonstrate to my peers that I had the right to be there. I needed to have the confidence to prove myself and the others that I was capable of sitting at the table. Is there anything about working at CERN, that you did not expect when starting? I did not expect to find such a diversity of professions available within the organisation. There are so many other careers available than just physics. CERN definitely offers many career opportunities. I was also very surprised by the importance of the value of collaboration within the organisation. CERN has a very flat structure based on collaboration. What do you believe is/are the most important skill(s) needed as a woman for an international career in your job field? This is not gender specific I believe. You need to have very good technical competencies. You need to be good at what you do. And you need to know what you are doing. You need to be hard working. You need to be aware that at CERN you are surrounded by very bright people all the time, that you work with highly skilled professionals. You also need though to have trust and confidence in yourself and believe that you can make it. What other insight would you like to share with a woman who would like to start her career at CERN? We need more women at CERN. It is a fantastic place to work here. I really believe in the support that the organisation gives to diversity, to have a very diverse work force. There are so many opportunities: do not hesitate to apply.